The e-mails flooded in for Tuesday’s piece on whether or not GM should be saved. There were so many you set a new record – thanks for that – with strong opinions on both sides. I’m still reading through all your comments, many of which are excellent. So we’ll dig into the mailbag next week. Let’s start with some background. In Wednesday’s Taipan Daily we noted that short-term interest rates have fallen to multi-year lows. The flip side of falling interest rates is rising bond prices. When bond prices rise, interest rates fall and vice versa. This means investors and traders have an impact on interest rates through their buying and selling decisions. When investors pile into bonds, for example, they push bond prices up – and interest rates down. 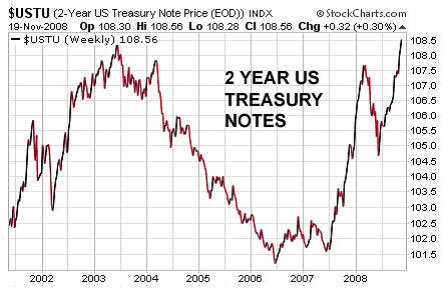 We can see this by looking at a chart of the 2 year treasury note, which went into lift-off mode in mid-2007 (right around the time the credit crisis began). As you likely know, investors are piling into U.S. treasuries now (particularly short-dated ones) because they are scared out of their wits and don’t know where else to go. And right now they are scared of deflation. For the month of October, the Wall Street Journal reports the Consumer Price Index (CPI) saw its largest single-month decline since World War II. This dramatic drop has the word “Deflation” on everyone’s lips. It’s quite the switch, actually. As recently as this summer, everyone was worried about Inflation. Now, according to some estimates, use of the word “inflation” in the popular press has dropped by nearly a third... and use of the D word, deflation, has more than tripled in the past two months. This is a head scratcher, especially in light of what we’ve been hammering on this past week. How can the markets be worried about deflation when the Fed is printing money like there’s no tomorrow? Better still, how is it even possible to see the specter of deflation on the horizon when trillions of dollars are being pumped into the system? Everyone knows about the basic concepts of inflation and deflation. They are often described in terms of supply and demand: inflation is “too much money chasing too few goods,” deflation is “not enough cash to go around,” and so on. But it’s important, too, to recognize that the inflation/deflation equation depends not just on the quantity of money in the system, but also how fast that money is moving through the system. This is where monetary velocity comes in. Imagine you’re standing in front of a large tree trunk. There is a brightly colored marker on the trunk, and there are rabbits running in circles around the tree itself. Every time a rabbit passes the marker on the trunk, you note it down on your clipboard: one X per pass. Now let’s say you tally up your results and note you made twenty X’s in the space of 60 seconds. Assuming you had your reasons, how could you double the number of X’s in the same amount of time? There are two ways you could double the number of X’s on your clipboard (to forty per minute in this case). You could increase the number of rabbits running around the tree... or you could go with the same number of rabbits and try to make them run faster. As you might have guessed, the rabbits are analogous to money in the system. Money that’s just there is inert... In order to have an affect on the economy, the money has to move. So when money is “hot” and the rabbits are running at top speed, fewer rabbits are needed to fill up the clipboard with X’s. The rabbits speed around the tree very quickly – analogous to high turnover, or money changing hands very quickly. When money is “cold,” on the other hand, the rabbits are lethargic, and you need more money (i.e. more rabbits) to get a decent number of X’s on the clipboard. If money stops changing hands entirely – as it seemed to have for a brief span in late September and early October – it’s like the rabbits coming to a dead stop. They aren’t moving at all. So when the Fed pumps the system full of money, it’s the equivalent of dumping more and more rabbits into the equation. As the Fed gets desperate, maybe they round up dozens or even hundreds of rabbits. But if all the rabbits are half comatose, the clipboard stays blank (or fills up much too slowly). The Fed’s efforts fail to have the desired effect. So the upshot is that the Fed can have a direct impact on the quantity of money in the system, but not the velocity of money in the system. It can’t make the rabbits run. The “rabbits” can also be thought of as entities that buy and borrow and lend – banks and businesses and consumers (like you and me). When banks refuse to lend and consumers stop buying and borrowing, monetary velocity goes down – even as the dollars in the system pile up. Over the years you may have heard comments like, “The Fed has absolute control over the money supply.” That is misinformation. The Fed has zero control in some very important areas. What’s more, they don’t even have the tools to properly measure many of these areas. When we talk about the velocity of money, for example, we’re not just talking about visible dollars. We’re talking about abstract concepts like people’swillingness to borrow and lend. That kind of thing is impossible to measure on any kind of precise basis. For example, if five million Americans wake up tomorrow with a sense the world is okay and an urge to go buy something, then that cheery mindset will positively impact the velocity of money in the system – even though you can’t put “optimistic mindset” on a balance sheet. Conversely, if five million Americans wake up fearful for the future and determined not to borrow another dime if they can help it, that translates into a negative impact. Again, there’s no way to precisely gauge these moods. We can only make rough guesstimates. Simply put, the rabbits are tuckered out. Okay, some of you may be thinking now, so the dollars are piling up because the velocity of money has crashed. The Fed’s stimulus remains untapped, like an idle oil tanker filled with cash. But if that’s the case – and if deflation worries could worsen – then why buy gold? What has this got to do with monetary policy? Like gold, U.S. dollars have value only to the extent that they are strictly limited in supply. But the U.S. government has a technology, called a printing press (or, today, its electronic equivalent), that allows it to produce as many U.S. dollars as it wishes at essentially no cost... We conclude that, under a paper-money system, a determined government can always generate higher spending and hence positive inflation. The underscore emphasis is mine. What Bernanke believes amounts to this: The printing press is an irresistible force. There is no deflation so immovable that the printing press cannot smash through it. An irresistible force sounds most impressive. When we think back to the velocity problem, though – recall the lethargic rabbits – the printing press starts looking like the wrong cure for the wrong ailment. This is because as far as money in the system goes, a velocity problem is different than a quantity problem. The printing press speaks to quantity, but on the question of velocity, it remains mute. Going back to our tree trunk analogy: Bernanke could round up a thousand rabbits, he could round up ten thousand rabbits, or he could round up fifty thousand rabbits. If the rabbits don’t feel like running around the tree, quantity does nothing. If banks and consumers cannot be goaded into the old patterns of buy, spend, borrow and lend, then it just doesn’t matter how much the Fed pumps in. Except for one thing: To say it “just doesn’t matter” is not wholly correct. The Fed’s stimulus-pump actions do matter in one particularly awful way. The more money a desperate Fed pumps into a non-responsive US economy, the closer we edge to systemic breakdown for the fiat currency system as a whole. My use of “breakdown” in this case refers to the point at which the world loses faith... the point at which investors realize in dawning horror that the world’s reserve currency is doomed. The trouble lies in the fact that the Federal Reserve has staked its whole crisis-response plan on the power of the printing press. The Fed, in other words, has but one play in the playbook... the play outlined in Bernanke’s deflation speech. If deflation’s grip is not broken soon, then Bernanke will double down on the printing press strategy... and then double down again. The Fed will pump and pump until the total pool of dollars in the system makes the United States look like a banana republic. It is this scenario, by the way, that keeps Jerome Whitehead awake at night. Whitehead, now 86 years old, is a former chairman of Goldman Sachs. "I see nothing but large increases in the deficit, all of which are serving to decrease the credit standing of America," Whitehead says. “Before I go to sleep at night, I wonder if tomorrow is the day Moody's and S&P will announce a downgrade of U.S. government bonds... Eventually U.S. government bonds would no longer be the triple-A credit that they've always been." Mr. Whitehead is right to worry. It may take a bit longer for Wall Street (and the world) to wake up and smell the bullion. But as to what happens in the medium to longer term, the distribution of outcomes is pretty cut and dry. If deflation is vanquished and money starts to move again, interest rates will stay low for a good long stretch of time (so as not to cripple a convalescing economy). In this scenario inflation returns, much to the Fed’s relief, and gold resumes its upward climb. If, instead, the Fed fails utterly, Bernanke will not go gentle into that good night. He will print his way into spectacular oblivion (as all but promised in his 2002 speech)... and Mr. Whitehead’s bad dream will be realized... and gold will respond accordingly.